Bonds of all flavors are seeing rising yields this morning as fewer people filed for unemployment last week than since any week in the last 15 years. At the same time, employment costs have risen 2.6% since this time last year. That is in large measure due to the Affordable Care Act, yet another ironic title to a government program. Much of the upward pressure on our mortgage rates is coming from rising rates on foreign debts, particularly from Germany, where the 10 Year has risen from .05% to .35% over the last week. 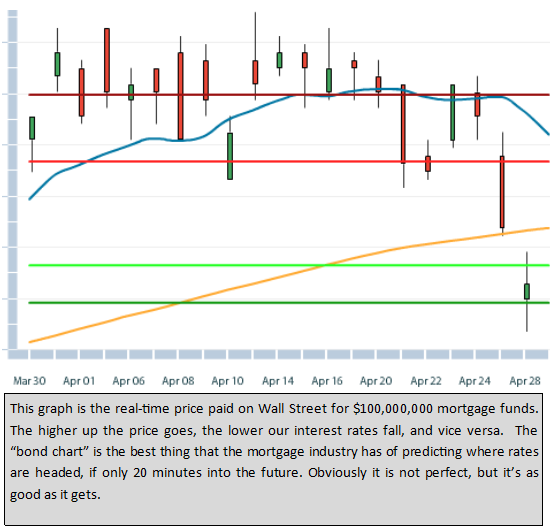 Prepare for higher interest rates ahead. Bonds have taken a 100 point beating over the last two days; this equates to having to pay an extra 1% in fees to get the same interest rate as you could have last Friday for free. Even a weak Q1 GDP reading hasn’t done much to curb the price decrease this morning. Q4 GDP for 2014 showed a growth of 2.2% and today’s first assessment of the 1st quarter was expected to show just under half that with a gain of 1.0%. Instead what we saw was 1/10 of the previous gain at 0.2%. What should have been a big boon to bond pricing and lower interest rates has had the opposite effect due to fear of the Fed raising interest rates. The Federal Open Market Committee wraps up their two day session this afternoon and the likelihood of an announcement of a rate hike after seven years at 0% is zero percent. Today kicks off the two day meeting of the Federal Open Market Committee (AKA: The Fed), culminating with tomorrow’s reading of their prepared monetary policy statement. The chances of them raising rates this session is about the same as creating an orange $500 bill; not impossible, but pretty slim. The Case Shiller Home Price Index showed that home prices rose 5.0% from this time last year. The price of homes continues to rise faster than the wage index. The old maxim that the house you buy today you won’t be able to afford tomorrow continues to hold true for many Americans. Surprising news was released this week that the number of new homes sold across the country declined last month after a long march upward culminated in a seven-year-high this February. Along with a decrease in the number of units, the median sale price of a new home sold in March also decreased, down 1.7% to $277,400. Despite the small correction in the new construction arena, the American manufacturing industry seems to be thriving. Durable Goods Orders for machinery and other tangible supplies rose 4% last month, a gain of 8X more than the expected advance. In other sector news, the tech-laden Nasdaq yesterday ascended above 5,000 for the first time ever yesterday. Unlike the Dow which has had some 100 all-time-record-high closing days in the last two years, yesterday’s Nasdaq feat was the first in 15 years. New Home Sales declined an additional 11.4% over the last month, which was 7.5% under market expectations. Despite that, D.R. Horton (not to be confused with Dr. Seuss’ “Horton”) reports almost $148M in net income this quarter. Interestingly enough, the movie saw net revenues of $212M when it was released in 2008. Realty Trac reports that there are currently 0.4% more homes with negative equity than this time last year. This makes the first quarterly increase in three years. Weekly Jobless Claims only up 1,000 from last Thursday, and 7,000 above the expected number. Despite all of the marginally poor economic data, Bond pricing is down again this morning, putting upward pressure on interest rates. Existing Home Sales rose 6.1% last month to 5.19 million annualized units, which was 2.7% more than analysts expected. Not only are more homes being sold, but FHFA (Fannie & Freddie’s mother with a less-catchy name) reports that housing prices climbed 5.4% since April 2014. Bond pricing is tanking this morning, putting upward pressure on interest rates. Perennial shoppers should be advised that that these great rates won’t last forever. The DOW has been down as much as 265 points this morning. Much is the concern is coming from economic turmoil in Europe. Here at home, the news is all about the consumer. Retail Sales rose .86% last month, while the price we paid for our stuff went up .23% at the same time. And we were happy about it; Consumer Sentiment rose more than analysts expected. On the heels of yesterday’s Housing Market Index, we have Building Permits and Housing Starts (both of these also a measure of the construction industry) released today. The released numbers were 5% and 12% less than the respectively anticipated data. I will reiterate the stance I took yesterday. With the supply of existing homes on the market dwindling, a boom in newly constructed homes is on the horizon. The Fed’s Beige Book comes out today, though I don’t expect any surprises. Speaking of the Fed, I anticipate that they won’t touch rates until at least October of this year. The Empire Manufacturing report, which was expected to show a reading of 7.3, came in at a -1.2 this morning. This index only tracks the manufacturing segment within the state of New York. A more important measure of our industry, the Housing Market Index, beat expectations by one point with a 56. The Housing Market Index measures builders’ gauge of the housing market throughout the country. Remember that the higher the number the better, and with the HMI, 50 is the baseline for positivity. Though we’ve been floundering near that level for some time, I would anticipate this index to skyrocket over the next few months as the inventory of existing homes for sale continues to decline. Tomorrow is tax day. I thought I’d pass along that reminder as well as this (above cartoon) bit of tax advice to keep your risk of audit to a minimum. The Labor Department shows that The Producer Price Index (a measure of inflation at the wholesale level) rose 0.2% last month, which was inline with expectations. However, the prior four months of negative gains have decreased the PPI 0.8% from this time last year. Retail Sales came in just under the 1.0% anticipated increase. Despite missing expectations, the positive number is another first in the last four months. Bonds are up and stocks are down on the news; the DOW is now back under 18,000 again.